Ryan grew up in a family of runners and followed suite by competing in cross country for the first time at age 8. Later, his athletic career took a turn towards triathlons, including 2 Ironman 70.3 events. Not only has Ryan competed, he has coached athletes at all distances of the discipline. He has also worked as a certified personal trainer (NASM-CPT), endurance coach, and as a CrossFit Level 1 Coach. Ryan is passionate about how the body moves and using movement as medicine. He continues to increase his knowledge and mastery of human movement, proper biomechanics and how to increase competency. 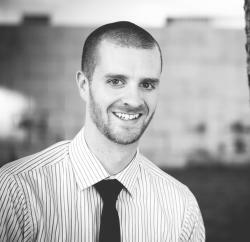 Ryan works extensively with RockTape as a certified FMT I & II provider. He also provides mobility, prehab/rehab coaching through his company Movement Cures. He approaches every athlete, client, and patient with this motto in mind: “Born to Move – Move to Live” and focuses on injury prevention and training for longevity. Ryan Meyers is currently enrolled as an intern in the Doctor of Chiropractic program at Southern California University of Health Medicine. Ryan serves in and works heavily with the Sports Medicine department. In addiction to his DC degree, Ryan is also an ACRB Rehabilitation Diplomate Candidate.